Working up a good lather for your face when wet shaving with a safety razor is essential to making the entire experience more relaxing and enjoyable. While some men prefer bowls for creating that thick lather, others prefer the handiness of a shaving mug. If you are new to wet shaving and safety razors, you may be wondering what is the best shaving mug to meet your needs. The answer is that the best shaving mugs are simply those ones that you feel comfortable using and working up a nice warm lather. The shaving mugs tend to be a little heavier and larger than the shaving bowls. I always check if the handle is comfortable enough to hold in order to have a good grip while you make the lather. Here are some mugs that fit this criteria well. Colonel Conk makes wonderful aromatic shave soap, so it seems only natural that they would offer a shaving mug to use when lathering up that soap and the Colonel Conk Model 129 super shave mug is definitely a mug worthy of this fine soap. 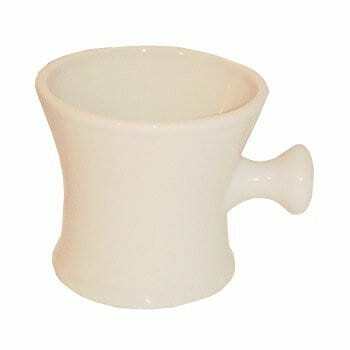 Oversize shave mug in an antique white color with cute little shave brushes designed around the cup bottom. 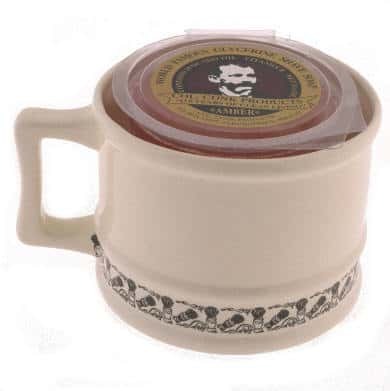 Comes with an unscented glycerin soap which contains avocado oil and vitamin E.
This is an incredibly handsome shaving mug that has an old fashioned barber shop look about it and is designed to hold Colonel Conk shaving soap perfectly, making it easier for you to work up that great shaving lather. The material of this cup helps to keep the lather nice and warm while applying it to your face. Nice Large Size- People like the fact that this mug is large enough for them to really be able to twill their shaving brush, work up a great lather and fill the brush with that lather to lather up their whiskers. Solidly built- This mug is solidly built and designed to last year after year of daily use. Sturdy Handle- Users truly enjoy its sturdy handle which makes it easy to hold while whipping up that lather and applying it. Sturdy cup made of rubber. Won’t chip, crack, slip or slide. This may not be the prettiest shaving cup ever made, but it is probably one of the most durable. It may also be ideal for those men who put function over aesthetics. The rubber on this shaving mug is sturdy, but not brittle so it will likely have a bit of bounce if it is dropped, and it certainly won’t chip if you bump the edge with the shaving brush. Creates a Good Lather- The mug actually has a small ledge inside that keeps the soap out of the water at the bottom of the cup, so you can create a good lather without melting the soap and making a soft gooey mess. Sturdy- This shaving product is extremely sturdy and designed to last for years. 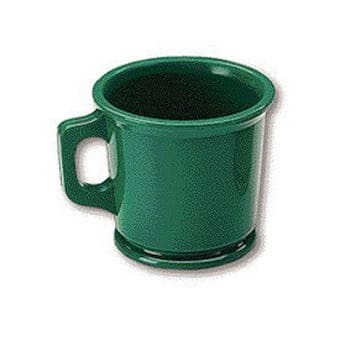 In fact, some users stated they had a version of this cup that has lasted them for 20 or 40 years of shaving. Nice Width and Depth- Users also find that this cup has a nice width and depth that allows them to really work up a good lather without feeling as though they are going to lose their brush into the depths of the cup. Black glaze with company name written in red. 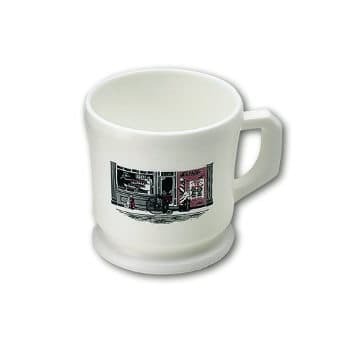 This Shaving factory Shaving Mug is a nice looking mug that is designed to hold larger bars of shaving soap. It will look nice in your bathroom, giving you a sense of a barbershop shave. The majority of users really like it and give it good reviews. A few feel that the mug is a bit too deep causing the handle of the shaving brush to bang against the rim and making them worry that the cup will eventually chip. Nice Shape and Weight- People like both the shape and the weight of this mug and find that it is perfect for creating that nice thick lather they love when wet shaving. Easy to Handle- Its easy grip handle makes this mug easy to keep a hold onto even with wet and slightly soapy hands. Helps Keep the Lather Warm- Since this cup is made of stoneware, users find that if you fill the cup with hot water a few minutes before using and then dump out the water and put the soap in, the lathers stays warm which feels better on face. If you are looking for a quality mug at an economical price, you should consider this Ceramic Shaving Shave Soap Mug With Ball Grip Handle. It is also available at a huge discount which makes it a real good deal. Rounded handle provides a good grip so it´s easy to make the lather. Can hold a soap of 2 ½ inches round. Don´t be misled by the fact that it is not made by one of the famous brands. It is a solid, fine finish shaving mug and as mentioned before the price is quite attractive, too. The size and shape is perfect to fit your shaving cake and its easy grip handle is convenient to make the lather. Although one or two users felt that the handle was a bit hard to grip especially if your hands are wet, most users were satisfied with the grip. It’s fairly tall so if you have big hands, you might find it difficult to reach the bottom of the mug. Nevertheless, the soap cake gives you some height too, so you don´t really need to get as far as the bottom. Finishing Quality- People reported that it seems like a good quality and nice finishing job been done on the ceramic. Rounded Grip- Overall responses were favorable relating to the grip being very convenient to hold and the look giving the feeling of a modern design. Convenient for Microwave- The solid quality makes it easy for the mug to be put in the microwave to give a slight heat to the shaving cake. Soap Fits Well- The size of the mug is just right, so the shaving soap fits well. If you are starting out with shaving or looking for a very economical shaving mug, I would recommend William Marvy Opal Shaving Mug. Don´t expect a fancy stylish mug but this will do the job extremely well and at a great price. Another favorable point is that it is handmade in USA. It gets very high ratings from the users, which says a lot about the product. Let me also point out that it is made of plastic but of a very good quality plastic which gives a nice feel to it. At the same time, the plastic makes it much lighter weighted compared to other ceramic mugs. Good Quality Material- The pastic is of a very good quality and feels quite solid. Also, an added quality point is that it´s made in USA. Ring at the Bottom- It has a ring at the bottom which makes it convenient to hold the puck. Unbreakable- This gives it a big plus that it won´t go into pieces if it slips out of your hands. A shaving mug may be a simple tool when wet shaving using a shaving razor or a straight razor, but users find that these mugs can be stylish as well as useful..